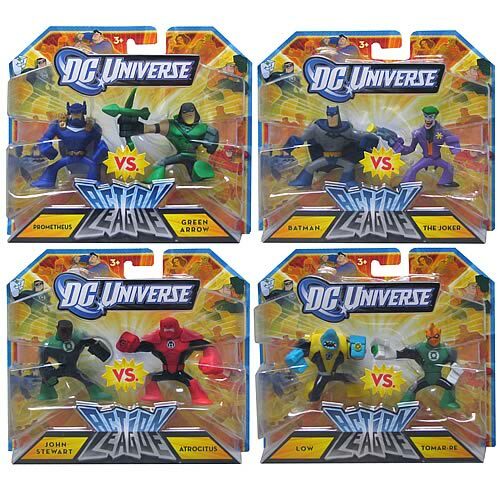 Mattel's DC Action League -- not these guys -- are the next evolution of their Batman - Brave and the Bold mini-figures. These pint sized heroes and villains are straight out of the pages of DC comics, sculpted in a cute, slightly more blocky style. You may have seen series one hanging on the pegs at Target and wondered quietly to yourself "where's Batman?" The stalwart of DC action figures was shockingly absent from the initial assortment, but series two finds the Caped Crusader packaged alongside long-tie foe The Joker. Green Arrow/Prometheus, John Stewart/Atrocitus and Tomar Re/Low round out assortment two.